Leading telecommunications and business solutions provider, PLDTKaAsenso co-presents this year’s Philippine SME Business Expo. MediaCom Solutions Inc., in partnership with Esquire Financing Inc., and co-presented by PLDT KaAsenso brings you this year’s premier business expo dedicated to empower the Small and Medium Enterprises (SMEs) in the country. This three-day event is happening on July 12 – 14, 2013 at the newly constructed SMX Convention Center Taguig, located at the 3rd floor of SM Aura Premier. PLDT KaAsenso has been well-known for their advocacy in empowering and nurturing the Filipino entrepreneurial spirit through the right programs and tools to help them progress into profitable enterprises. KaAsenso aims to be the partner of every Filipino entrepreneur, well-balanced success both in business and at home. 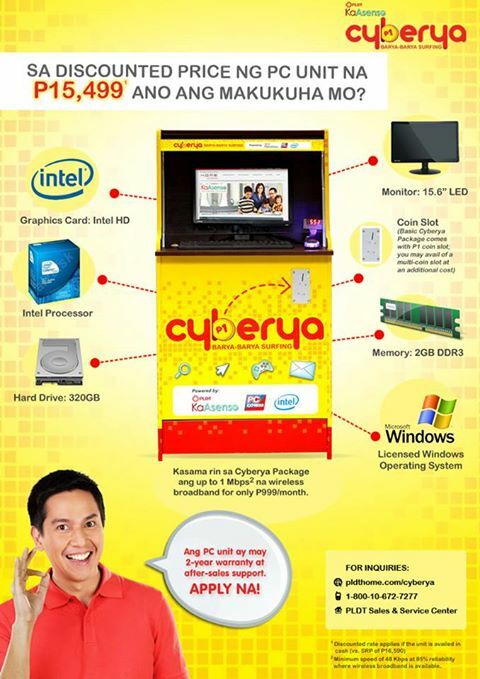 Recently, they launched “Cyberya”, the solution for who want to start their own business for a small capital. It is an internet rental service, which guarantees high-profit despite its low maintenance. This barya-barya surfing was made for aspiring entrepreneurs in the country. This partnership was made possible through the same advocacy: nurturing entrepreneurship. The Philippine Business SME Business Expo – “Your SME Business Gateway” will showcase the growing SMEs and aims to strengthen their gateway towards innovation in the growing Philippine market. “The PHILIPPINE SME BUSINESS EXPO is a premier event where company owners can expand their business and network with other growing industry players. We also encourage young professionals to come that want to learn how to start a business and explore the newest products and services the countries leading SMEs have to offer”, says MEDIACOM President and Expo organizer David Abrenilla. Participants will be inspired and get the latest industry insights from speakers like celebrity runner Coach Rio dela Cruz of Runrio, best-selling book author and wealth coach Chinkee Tan, Rolex Awards for Enterprise Awardee Reese Fernandez, Beauty and Wellness Guru, Cory Quirino, motivational speaker, Randell Tiongson, DigitalFilipino.com E-Commerce Specialist, Janette Toral; MetroDeal founder Ralph Wunsch, Mansmith’s Rowen Untivero, CSR founder Mon Abrea, Multi Awarded Entrepreneur,Wilson Lee Flores and many more. Visitors will be able to enjoy exciting discounts and raffle prizes. This entry was posted on Friday, July 5th, 2013 at 12:00 am	and tagged with Chinkee Tan, Philippine SME Expo 2013, PhilSME Expo 2013, PLDT Cyberya, PLDT KaAsenso, press release and posted in hodgepodge, philippines. You can follow any responses to this entry through the RSS 2.0 feed.